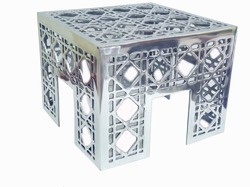 Our product range includes a wide range of aluminum coffee table, aluminum accent table, casted aluminum table, aluminum corner table, casted aluminum chair and aluminum hammered stool. We are the established manufacturer and exporter of Aluminum Coffee Table that is highly acclaimed for its exquisite design. Resistant to corrosion, it has been widely praised in the market. Subjected to quality checks on various parameters, we assure the premium quality of the whole range of aluminum coffee table. Furthermore, this offered product is known for its dimensional stability. 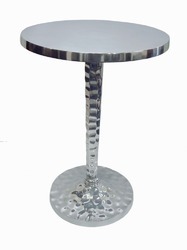 We are proficient in the manufacturing and exporting of best quality Aluminum Accent Table that is widely known for its unique design. Owing to the high-grade metals and alloys used while manufacturing, it is highly durable in its features. Known for its anti-corrosive properties and fine finish, the range of aluminum accent tables offered by us is highly demanded in the market. 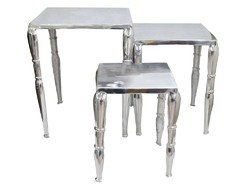 We are one of the few names to offer Casted Aluminum Table that is manufactured using high-grade metals and alloys. Known for its superior finish and dimensional stability, the whole range of the casted aluminum tables offered by us is highly demanded for its resistance to corrosion and wear and tear. This offered table is further widely appreciated for its long lasting life. 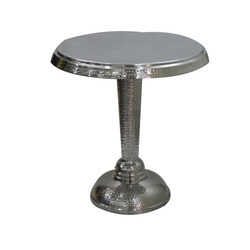 We are known for manufacturing and supplying a high quality Aluminum Corner Table that is made using high-grade aluminum procured from the reliable vendors. Known for its dimensional stability, it is widely considered among our customers. In addition this, the entire range of the aluminum corner table offered by us is known for its perfect finish and durability. 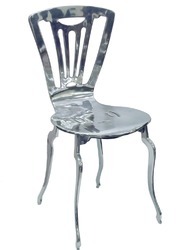 We are leading manufacturer and exporter of superior quality Casted Aluminum Chair. 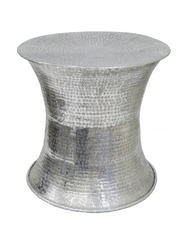 We are leading manufacturer and exporter of superior quality Aluminum Hammered Stool. 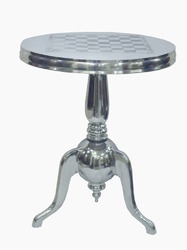 We are offering Aluminum Nested Table to our clients. 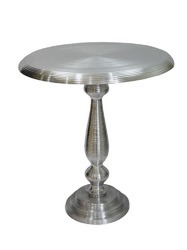 We are offering Aluminum End Table to our clients. 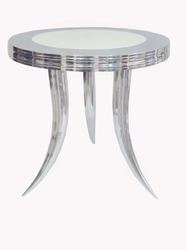 We are leading manufacturer and exporter of superior quality Sheet Aluminum Hammered Table.